VERNON — Vernon Mayor Victor Marotta gave $66,000 in “performance awards” to 20 non-contractual township employees in December 2012. Non-contractual generally refers to hires outside the purview of a labor union, in which salary terms are built-in and protected through pre-negotiated contracts. The payments were made five weeks after the Nov. 6, 2012, defeat of the salary ordinance ballot question – of which 87 percent of Vernon voters opposed. The ordinance would have increased the mayor’s salary from $30,000 to $50,000, the council president’s salary from $3,000 to $6,000, and the council members salaries from $3,000 to $5,000 each. The ordinance also proposed raises for 16 municipal employees at various ranges. Of the 20 employees who received performace award bonuses on Dec. 11, 2012, 15 were slated to receive raises as part of the defeated salary ordinance. The bonuses awarded range from $2,000 to $5,000. The biggest bonus was paid to business administrator Gerry Giamis. Municipal clerk Susan Nelson received $4,500. “Once the budget has been adopted by the council, the expenditure of funds in the budget – as long as they are not outside of the line items that have been laid out – are in the purview of the mayor,” said Marotta. Marotta said that money was given back to residents through tax reductions in 2013, and was used to pay down bond debt and add to the township’s cash surplus. The Advertiser News North then reviewed videos of the mayor’s reports at every council meeting from August through December 2012 and no mention of the awards program was made. Marotta did not respond to a request for further clarification. In an interview Tuesday, Marotta said that the performance award program started as an evaluation tool for township managers and was not initially designed as a mechanism to award bonuses. It is unclear when he decided to make performance awards part of that evaluation process. Money that could be used in the program is part of the 2013 municipal budget adopted by Vernon on April 8. But Marotta stressed that it will not necessarily be used for the program. The 2013 budget includes money reserved in line items for salaries and wages for the township’s various departments. Marotta said the money could be used for merit bonus pay or for a raise in one of the departments. “If it’s warranted after the administrative team goes through the evaluation process and sets objectives as we go through 2013, they may very well be paid, they may not be paid,” said Marotta. Marotta said that he did not receive a bonus and that nobody on the council received bonuses. Councilman Dan Kadish said he was unaware of the program until the April 22 council meeting and did not know that $66,000 in performance awards had been paid out in December 2012. Lynch said Marotta made him aware of the program sometime in the fall of 2012, but could not recall whether Marotta mentioned the program in a council meeting or at some other time. Lynch said he was aware that $66,000 in performance payments had been made in December 2012. Kadish and Lynch were the only councilmen to respond to a request for comment. 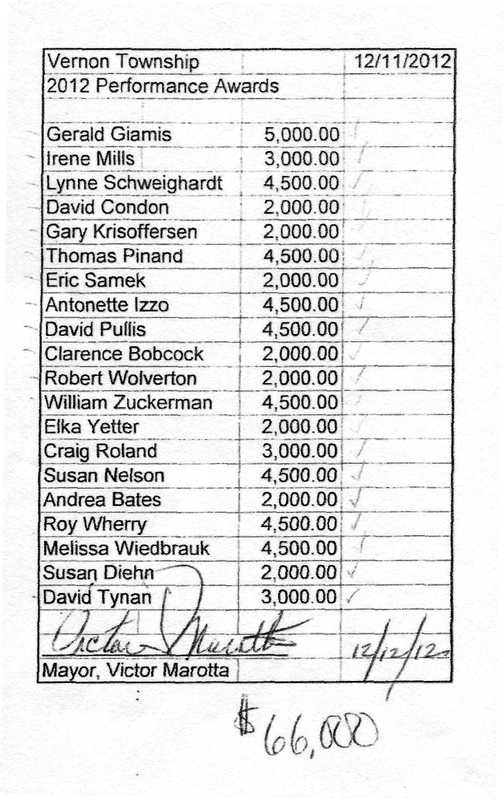 A document obtained by The Advertiser News North shows that $66,000 in performance award bonuses were paid to 20 township employees on Dec. 11, 2012.